This isn’t a post about traveling to Chile although I sort of wish it were because it’s still cold outside! Instead, I am sharing one of my favourite go-to’s for chili that is easy, tasty and ready in 30 minutes! I first came across this recipe when I was living in London (yes in England, not Ontario), in a shared flat with two other girls. Of course I didn’t know anyone at first but they were kind and invited me to their dinner parties. One of the best was when the flat was full of hungry friends and everyone had a steaming bowl of chili. Over time, the recipe has sort of evolved, like most things. What I love is how versatile it is. I’ve mixed and matched different amounts of my favourite veggies and it always tastes good. The secret ingredient of cocoa powder adds depth to the colour and flavour. Different ways to serve it, make it a great choice for a quick weekday meal or even as a fun option for game day! Thanks for this presentation idea, Chef Ryan! Options are provided below to make it veggie, also how to prepare using a slow cooker. Chop the onion and mince garlic if using fresh. In a large saucepan, brown the beef with garlic and onion over medium-low heat. While the meat is cooking prepare the other veggies. When the meat is almost done, add in the grated mushroom, carrot and cut pepper. Cook until the veggies are soft, approx. 10 minutes, stirring occasionally. Let simmer on low with lid on for approx. 10 minutes. Stir occasionally. Weekday Meal: Serve on top of white or whole grain rice with a green side salad. Using Leftovers: To change it up, serve chili on top of a jacket potato (i.e. baked potato). London, 1994: Serve on white rice, and pour cream over the top! 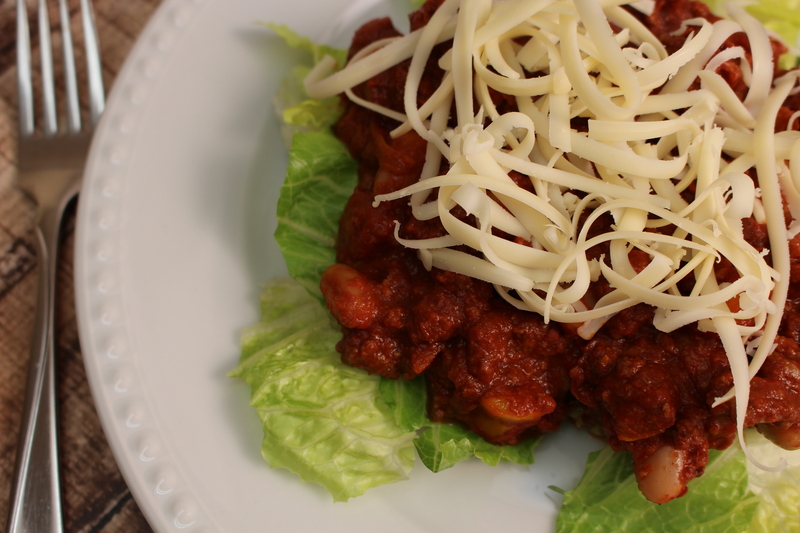 Game Day a la Chef Ryan: Serve chilli on a bed of chopped, fresh iceberg or romaine lettuce. Top with grated cheddar cheese and sprinkle with broken up nacho chips. Have extra chips on the side to dip in as well as sour cream for those who fancy it. Tip: Add extra veggies that you love or need to use up in the fridge! Try grated zucchini, chopped celery or kohlrabi! Veggie Option: Omit the beef and beef stock cube. Add a veggie stock cube and extra veggies or beans, as you desire. Slow cooker option: Throw all of the ingredients in the slow cooker and cook on high for about 4 hours or low while you are at work all day (8 hours). Next Post Homemade Lemon Curd is so good! Lovely recipeand looks impressive. I would like to try the vegetarian version. Hi Coconut Craze, thanks for commenting. Are you veggie?